The Saanich Planning Department contacted the Community Mapping Initiative to facilitate community outreach and engagement for the Shelbourne Corridor Action Plan. The intent of the Plan is to develop, in consultation with the community and other stakeholders, a comprehensive, long range (20 to 30 year) vision for an area 500 m on either side of Shelbourne St. from North Dairy Road in the south to Feltham Road in the north. 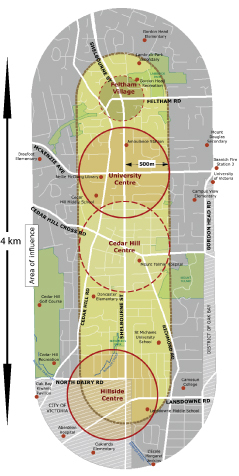 This Corridor includes 4 Centres of mixed use (commercial, institutional, residential) development at: * Hillside (North Dairy and Shelbourne) * Shelbourne Village (Cedar Hill Cross and Shelbourne) * University Centre (McKenzie and Shelbourne) * Feltham Village (Feltham and Shelbourne) Visit the Saanich website for details about the plan, events and how to get involved.